I sometimes think the most important thing I do at the lake is watch the natural world. It is a full time job! I spend a lot of time hunting and fishing but watching the daily goings on is something I always do when I am working outside, cooking on the grill, checking a neighbor’s crawl space, or just sitting on the porch. Maybe I am just lazy but I can put the saw or rake down to watch an eagle tacking high over the lake or learn a little from a hen mallard on protecting her ducklings from that eagle. I hope these natural common occurrences never become mundane for me and I will always marvel at the agility of dragonflies eating mosquitoes (something to be thankful for as well!). We watch a lot of things at the lake like weather, animals, changes in plant life, the way the water moves, etc. Watching the sky particularly on a day when the sky is cerulean blue and has clouds of various shapes can be mesmerizing. On those days I think the UP is Big Sky Country not Montana. It is nighttime when the sky becomes even more intriguing. Clear nights boldly show the stars and planets particularly when the moon is just a slice. It can be a special reward to those who get up in the middle of the night. 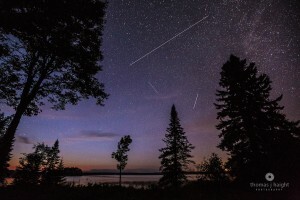 This past summer and fall were full of memorable nighttime events such as the Perseid Meteor Shower, Blood Moon, and Northern Lights on several occasions. The evening of September 7 and the following early morning was special. It started out with Northern Lights that were spectacular. We have several windows facing north and have a nice opening in the trees north as well. The lights were mainly pale green, pulsed often with a lot of horizontal movement. We probably watched them on and off throughout the night for a total of an hour and a half. As dawn approached the Northern Lights faded but the moon was a sliver and the Milky Way was really bright. It was almost as if it was a cloud in the sky until your eyes adjusted. Orion was very prominent in the eastern sky with his dagger hanging off his belt chasing the Seven Sisters (Pleiades/Subaru). Venus (the morning star) was aligned close to Jupiter and the moon. They tell me that a faint Mars was also present which I mistook for a star. As the sun started coming up the stars began to fade and two eagles flew to the east as I motored out to fish. They landed on the dead white pine close to the outlet of the Perch River and were highlighted against the lightened sky. They started their eagle chatter and a couple of coyotes let loose to add to the chorus. It was almost as if nature was putting on a show with several encores! The fish were cooperative until lack of sleep took over and I headed in. The morning is firmly entrenched in my memory. I often think that memories and experiences are the things that really make us rich but sometimes we seem to be too busy to give them their due notice. They are like a $50 bill laying on the sidewalk or a bunch of morels under a dead elm!